Insiders Hawaii. This new summertime sailing weaves through the islands with a focus on cultural connections, wildlife-rich encounters, and adventure. Prices quoted here are often dependent on currency fluctuations. Please check with (01432 507450 or info@small-cruise-ships.com) for the very latest price, which may well be cheaper than the one advertised here. Queen or twin beds, windowed door and view window, private bath with and shower. King or twin beds, windowed door and view window, private bath with and shower. King or twin beds, windowed door and view window, private bath with Jacuzzi hot tub and shower. King or twin beds, windowed door or view windows, private bath with Jacuzzi hot tub and shower. Queen bed, windowed door and view window, private bath with and shower. Separate sitting area, king or twin beds. View window and a sliding glass door opening to as small balcony, private bath with Jacuzzi tub and shower. Say ‘Aloha’ to paradise. Settle in with a glass of bubbly and a prime spot on deck. Kick off the week cruising the coast of Molokai for the sunset along this beautiful, untouched shoreline. Dive in to the week with an exploratory snorkel in a tropical island bay. Or maybe, toss your gear aside and go for an easy swim. Then it’s “critter cruising,” as our on-the-lookout guides like to say. Dolphins, sea turtles, and technicolor fish are all possibilities—you never know what’s swimming. Welcome to Lana’i. No shopping malls, public transportation, or traffic lights, the island is a nostalgic reminder of old Hawaii. The “Private Island,” some say. Visit a secluded beach for a spin in a kayak past dramatic rock formations and volcanic landscape. Take in Sweetheart Rock, a sea stack jutting 80 feet above the surf, to discover the legend of the princess Puu Pehe. Tonight kick back in the lounge for a presentation with your Expedition Guides about Hawaii’s marine life. With the largest volcano in the world—Mauna Loa—on one side and deep green valleys on the other, Hawaii’s Big Island is a beautiful example of habitat diversity. Start with an easy stroll through Kailua-Kona town dotted with historic buildings between beaches and lava-lined coves. This evening you’re in for a treat—a night snorkel with Giant Pacific Manta Rays. Watch these big guys feed and feast while you ‘ooh’ and ‘aah’ through your snorkel mask. Kona’s coast continues to dazzle with a rainbow of colorful corals, sponges, and tropical fishes beneath the surface. Friendly dolphins too. Say ‘hello’ by snorkel or tool around the bay in a kayak or skiff. And for those ready to “find balance” in the island’s beauty, grab a paddle board and go exploring. Thousands of years of erosion created Maui’s lush, dramatic valleys. Loved by many as some of the best beaches in the world, you’re in the place to get in the water. Snorkel in coral gardens packed with marine life. These waters are home to sea turtle feeding stations where schools of fish feed off the plankton attached to the backs of sea turtles. Just one of Mother Nature’s neat little tricks. End the week in one the island’s ancient areas, the Halawa Valley. Feel the lore of the past on a hike alongside waterfalls through Halawa’s cathedral valley, or take in a cultural lesson and poi making. Listen to the chants, songs, and stories from a local family and kupuna who have inhabited this land for over 13 generations. Live aloha with a delicious Pa’ina (feast) paired with a home-style Hawaiian jam session. This evening, celebrate with a photographic recap of your adventure. One last island-fresh breakfast and decadent pastry. Disembark the Safari Explorer at the dock in Molokai, where you'll be transferred to the airport or to your extended UnCruise hotel stay. Itineraries are guidelines; variations in itinerary and the order of days may occur to maximize your experience. The Safari Explorer, our flagship, is a 36-guest luxury yacht perfectly designed for "luxury in the pursuit of adventure." Features include an intimate Wine Library and spa area including a large on-deck hot tub (Alaska), sauna, fitness equipment, yoga classes, and a complimentary massage. Aboard the yacht, three public decks provide plenty of room for mingling, relaxing, and enjoying the fresh air. And a full-beam swim step makes for easy access in the water. Adventure equipment onboard includes kayaks and stand-up paddle boards; inflatable skiffs; hiking poles; fishing poles and tackle; yoga mats; and hydrophones for listening to below-surface sounds. There are six stateroom categories aboard the Safari Explorer: Single; Master; Commander; Captain; Admiral; and Commodore Suite. Depending on the stateroom, singles, doubles or triples can be accommodated. Common to all Safari Explorer staterooms are: Heated tile floors in bathroom; Tempur-Pedic® memory foam mattresses; Flat-screen TV/DVD; iPod docking station; and View windows (no portholes). Insiders Hawaii. This new summertime sailing weaves through the islands with a focus on cultural connections, wildlife-rich encounters, and adventure....click here to read more. 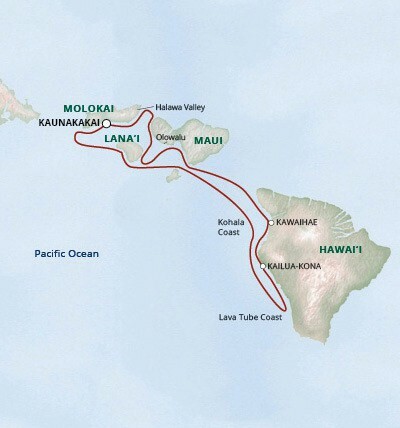 Your inclusive exploration, aboard a 36-guest yacht, carries you among the islands of Moloka‘i, Lana‘i, Maui, and Hawai‘i. Cruise along shore and watch marine life gracefully leap around your skiff; ......click here to read more.